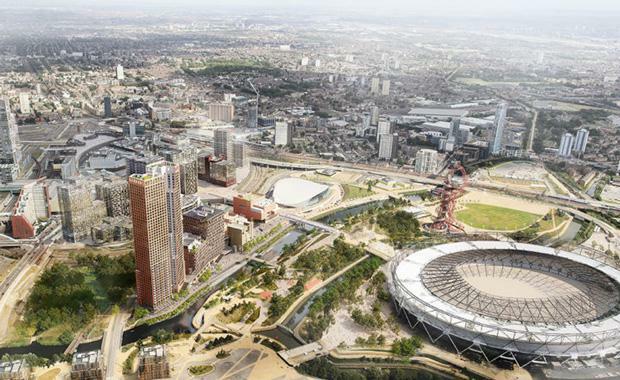 New images have been released by the London Legacy Development Corporation of the cultural district to emerge on the 2012 London Olympics site. 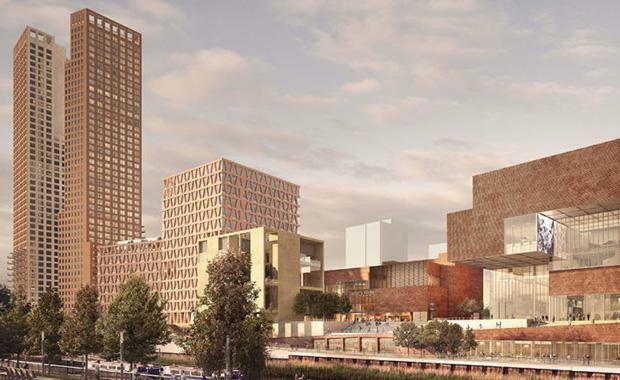 The Stratford Waterfront site scheme (Olympicopolis) is expected to create 3,000 jobs, attract 1.5 million visitors per year and provide a £2.8 billion boost to the economy of Stratford and surrounds. Bob Allies, partner of the masterplan architects, Allies and Morrison, said, “One of the most exciting aspects of this project has been the collaboration, between the LLDC, the cultural partners, the three architectural practices and the wider consultant team. “What we are making is an extraordinary new piece of city, a crucial part of the urban framing of the Queen Elizabeth Olympic Park with five individual buildings shaping and sharing a common public realm. Stratford Waterfront is a new neighbourhood that will enable some of the world’s leading cultural and educational institutions to reach out into the east London boroughs that hosted the Olympic Games. This important legacy investment will create new venues for Sadler’s Wells, UAL’s London College of Fashion and the Victoria & Albert Museum, as well as a significant number of new homes, retail space, a high-quality public realm and additional cultural/community spaces that extend the Park’s reach while inviting residents and visitors alike to participate in an exciting cross-pollination of culture, education and research. The masterplan achieves this through accessible and porous architecture that is welcoming to peoples of all walks of life. On a slender site along the River Lea, nestled between Carpenter’s Road and the WaterWorks River, the new buildings will occupy a prominent position on the Park’s eastern edge, approachable and connected through a sequence of clearly legible public spaces. 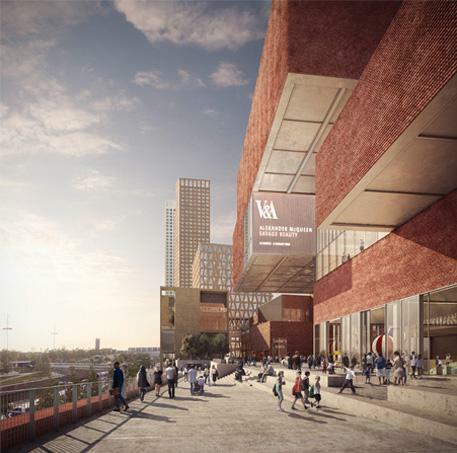 Opposite the London Aquatics Centre and completing a new civic space will be V&A East, a new building to showcase world-class collections of design, art, architecture and performance in spaces that the V&A will curate in collaboration with America’s national museum, the Smithsonian Institution. A south terrace provides a large welcoming space for exhibitions and performances, which overlooks a new terraced piazza with broad steps that connect the site to the river, providing both a dramatic setting and generous room for casual seating. 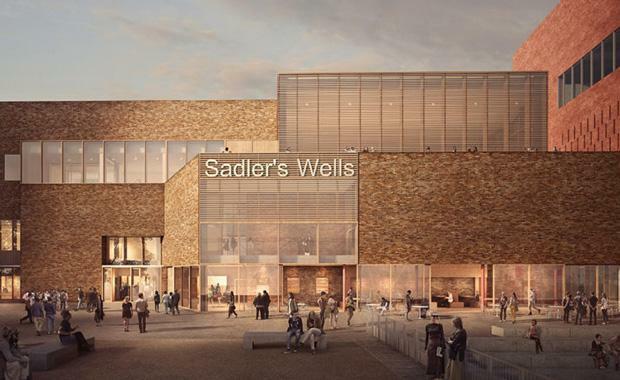 This open area is framed by Sadler’s Wells East and a new cultural building for a yet-to-be-determined institution. A north terrace provides more areas for casual seating and spaces for informal gatherings and performance, providing a foreground to UAL’s London College of Fashion. At the northern end of the site are two residential buildings, each 47 floors high, and Carpenters Lock Gardens which provides a crucial link to Hackney Wick. The sitewide design encourages interaction and supports the public programming of the institutions. The public realm’s sequential permeability will create not just a nice place to be, but spaces that foster interaction and enable the institutions to experiment with new ways to engage with the public. The openness of buildings at pedestrian level and their integration with new public areas and routes is highly civic in character, yet approachable and informal. These 24/7 spaces will allow opportunities for events, performance and other artistic interventions but they will also provide attractive places for visitors and neighbourhoods to enjoy – places to share a picnic, watch the view, relax in the sun. Each building is unique but draws on a common palette of references to Stratford’s industrial heritage. Befitting of the strong identities of their individual institutions, each will be distinctive in presence yet form part of a family, reinforcing the idea of a unified place rather than a collection of disparate objects. At the scale of the individual buildings, Allies and Morrison is designing the London College of Fashion, the new cultural building and residential towers; O’Donnell + Toumey are the architects of the V&A East and Sadler’s Wells East and Arquitecturia Camps Felip is designing the Carpenters Land Bridge. The Cultural and Education District will be the single largest project of its kind since the legacy of the 1851 Great Exhibition and Exhibition Road in South Kensington. 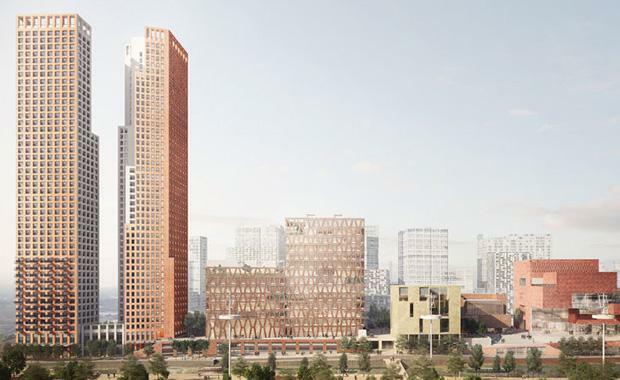 Our work on this project is the latest chapter in a longstanding engagement with the legacy commitment to east London, which began with the masterplan that first secured the Games. A planning application is to be submitted in the winter of 2016 with anticipated completion of the cultural and education buildings by 2020/2021 and the residential development is due to open in 2022.